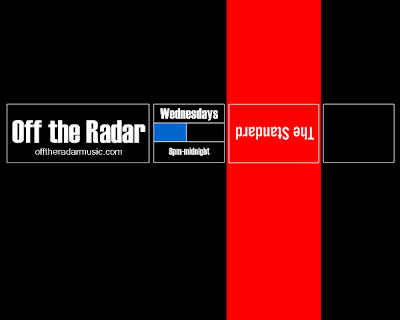 ::: Off the Radar :::: OFF THE RADAR RETURNS!! Tonight @ The Standard Hotel from 8 PM to Midnight!! OFF THE RADAR RETURNS!! Tonight @ The Standard Hotel from 8 PM to Midnight!! Pretty hectic this week with Holidays and all, but just wanted to write a quick post to let everyone know the Off the Radar 'Party' which has been on hiatus will be Returning in 2009 as a weekly gathering at The Standard Hotel on Miami Beach early Wednesday Nights from 8PM to Midnight, Starting January the 7th!! Pretty excited to have it back! The Standard asked us to come in and spin similar stuff to Off the Radar, so we figured this would be the perfect time to bring back the Party which was actually around a couple of years before the Blog even got started. We hope you guys are excited and will join us for cocktails, conversation, dinner (The Standard Kitchen is Open all Night and has some nice entrees/appetizers) and most importantly to sample some of the amazing music we showcase on the blog every week in the beautiful/relaxed environment of the Standard Hotel! It's an early thing from 8PM to Midnight as their liqour license can only serve drinks till 12, so if you work early there's no reason you can't make it out. You can have some dinner, a glass (or 2) of wine, listen to some great music and be home in bed by 12:30 or 1 latest! If Midnight is too early for you to go home we're gonna be hosting After Parties right next door at Purdy Lounge were our good friend Joshy Josh is the Resident and Off the Radar DJ's will be doing Guest Sets! Spread the word! Hope to see you there! CHEERS & HAPPY NEW YEAR! !